One can glimpse gerrymandering at work here in Florida by consulting the 2012 U.S. House election results. Republicans candidates won the popular vote, but through gerrymandering they squeezed out two extra seats. Critics correctly counter that, depending on the state and decade, both parties gerrymander. Every ten years—after each new census—whatever party dominates a statehouse draws the lines so as to create the reddest red or the bluest blue districts. After 2010, the Republicans were well situated to draw the lines that gave them the current majority in the House. If both parties do it, why not put an end to this nefarious practice? 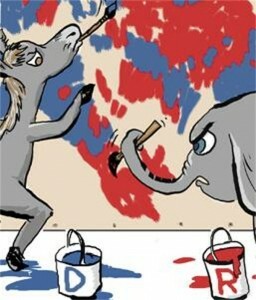 I don’t want my party to gain the advantage based on how its leaders draw the lines, and I suspect most Republicans feel the same about their party. So, rather than have the party that won the most recent election undertake the decennial process of drawing districts, why not have a bipartisan commission or panel of retired judges do it? In California a Citizens Redistricting Commission now draws the lines for state government elections. The results have been far from perfect (there have been a lot of complaints), but most observers agree the new districts are more “purple” than “red” or “blue.” Wouldn’t ‘far from perfect’ be better than what we have now? If the party that loses the popular vote continues to dominate the “popular” Congressional chamber, will we not be—to borrow Yeats’ and Didion’s phrasing—slouching toward Bethlehem?